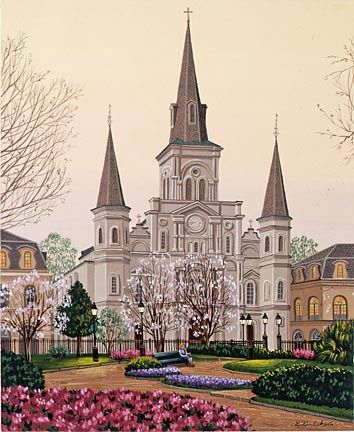 Home | Serigraphs and Giclee Fine Art | Liudmila Kondakova Parisian Art | Liudmila Kondakova Hand-Crafted Lithograph on Paper:"Dawn-in Jackson Square"
Liudmila Kondakova Hand-Crafted Lithograph on Paper:"Dawn-in Jackson Square"
About the Artist:Her paintings are so rich with clarity and light that they reflect in their extraordinary draftsmanship a sense of artistic and spiritual well-being. One might describe her style as Romantic Realism-her meticulous attention to every detail allows us to become intimately involved in the life of her paintings.In the artist's words: "To me, these streets, with their worn cobblestones and aged buildings, evoke a sense of nostalgia and romance with a touch of melancholy. It is the ideal kind of space in which I would like to live." Since her childhood in Russia, Liudmila Kondakova has been fascinated by traditional art, by a sense of spirituality that transcends common existence. Her painting technique is that employed by medieval egg-tempera painters. Her palette-influenced by the icon painters of Byzantium and later, Russia-is both vibrant and beautiful, with colors that blend in a subtle, poetic balance. Born in Russia in 1956, Liudmila Kondakova immigrated to the United States in 1991. A graduate of the Grabar Center in Moscow, she also attended Russia's School of Sacred Arts, the Moscow Pedagogical Institute and the Moscow Art Institute. Kondakova connects her highly trained background to her artistic expression this way, "In my art, the essence and beauty has always rested in the details." With her work in private collections around the world, original paintings and serigraphs by Liudmila Kondakova can be found in galleries nationwide. A new book, "Liudmila Kondakova: A World of Enchantment" has recently been published by Jenkintown Press of Pennsylvania. This book surveys all serigraphs published by Chalk & Vermilion along with the artists' paintings from 1995 to the present. Home | Fine Art Prints & Limited Editions | Gallery Direct Art is your Authorized Chalk & Vermilion Dealer | Liudmila Kondakova Parisian Art | Liudmila Kondakova Hand-Crafted Lithograph on Paper:"Dawn-in Jackson Square"